Play Earth Defense Force Now! Earth Defense Force is a pretty fun game. It's a side scrolling shooter, a lot like Gradius or Life Force. The graphics look great and the sounds are pretty good too. The BG music is a little annoying sometimes, but the sound effects were good. like many of these type games, there is no story to speak of. The gameplay was great. There were several different strategies to choose from. The controls were easy to use and fluid. 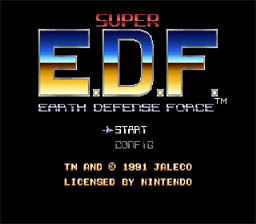 If you like games like Gradius and Life Force, you'll love Earth Defense Force. You can speed up any time you want to, by pressing X. You gain levels as you gain experience. As you gain levels, your weapons and shields will become stronger. You start with three hit-points worth of shields, you can get up to five. There are also a lot of weapons to choose from, and you can change not only at the beginning, but also between levels. Try different weapons on different levels, figure out which one works best for you. You have two satellites that help you out. By pressing A, you can toggle between them sitting by your side, and circling you. Kill as many enemies as you can, and fight your way to the end through six levels and bosses to save the Earth. When selecting weapons, it's good to know that the S. Laser is hands down the best weapon.